Your cover letter is often the very first contact you will have with a recruiter or employer, so it needs to make a great impression. A poorly-worded and sloppy introduction will make you look unprofessional, and could even mean that your CV doesn’t actually get opened. However, a professional and persuasive cover letter will greatly increase your chances of getting shortlisted for roles. 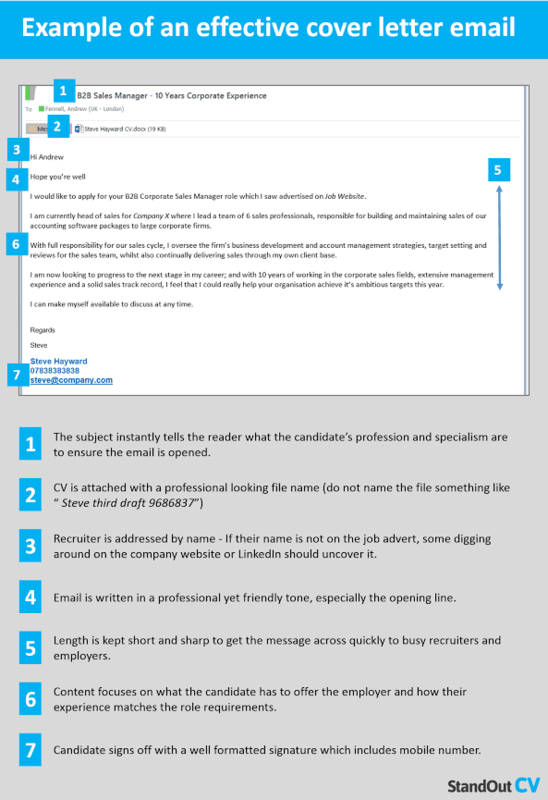 In order to ensure that you make it over this first hurdle of the job application process; CV writing service StandOut CV has put together an infographic showcasing a winning cover note. When possible, you should always send your cover letter via email to give yourself maximum control over the look and feel of the message. When you send a cover letter through a job website messaging system, the resulting message will be converted into a plain text email that won’t look very professional. So always attempt to seek out the recruiter’s email address and send them a direct email. If you cannot find their details on the job advert, try searching on LinkedIn or the company website. To make access easy for the reader, write your cover letter in the body of the email as opposed to attaching as a separate document. Be mindful of how you name the file of your CV as it will be clearly displayed when the email is opened. The best way to ensure that your emails are opened, is with an eye-catching subject line. If your subject line is boring or irrelevant to the role, then it may go unnoticed by recruiters. Recruiters want to see highly suitable candidates when they look into their inboxes; so give that to them in your subject line. Outline your most relevant experience in your subject line, in order show that your email is worth reading. Cover letters should obviously be well written with perfect grammar, but that doesn’t mean that you can’t inject some personality. Being overly formal in the modern job search landscape can actually be a huge turn off for some employers. The phrase “people buy people” holds very true in recruitment so write in a friendly tone to show that your business-social skills are up to scratch. The writing style of your cover letter should demonstrate your professionalism, but also your ability to connect with people on a personal level. The days of cover letters taking up a whole page of A4 are thankfully over. Unless an employer specifically requests otherwise, you should always keep your cover letter short and sharp. Some recruiters will receive hundreds of applications per week, so there is no point in trying to make them read a lengthy cover letter – they just don’t have the time. Keep your cover letter to around 2-4 sentence to ensure that you get your point across quickly without boring readers. Breaking the text up into short simple lines, will ensure ease of reading and make the information quickly digestible. In order to persuade recruiters to consider your CV, you simply have to indicate that the experience contained within it, is suitable enough to perform the role you are applying for. A very high level summary of your experience that doesn’t go into too much detail should be enough to tempt recruiters in. In particular you should determine the most essential requirements from the job advert and make sure that your cover letter reflects those abilities. At this early stage, you should avoid mentioning demands such a salary and holidays to avoid appearing pushy. You can always discuss these points during your initial telephone conversation with the recruiter. Always end your cover note with a friendly salutation such as “kind regards” and a well formatted professional signature that includes your mobile number. This will add to the professional appearance of your cover letter and show that you are well versed in business-email etiquette. It also means that the recruiter will have a direct method of contacting you, even if they cannot open your CV for any reason.